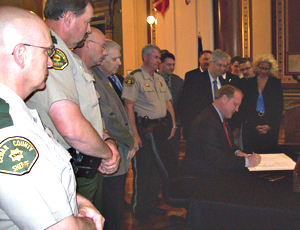 Governor Culver signs the gun bill as law officers look on. Members of the National Rifle Association and a handful of sheriffs were on hand this morning as Governor Culver signed a bill into law which sets a statewide standard for issuing permits to Iowans who want to carry a concealed weapon. The Iowa Sheriffs and Deputies Association had opposed the bill, but Cedar County Sheriff Warren Wethington made the trip to Des Moines today as a show of support for the new law. “There was some tension and there will be, but after a year has passed and there hasn’t been any problems, it will all be forgotten,” Wethington says. Sheriffs will now have to submit their reasons, in writing, if they deny a concealed weapon permit, and the applicant can appeal that decision. “It’s right in the legislation what kind of training’s accepted, who qualifies, who is disqualified,” Wehtington says. “It takes a lot of the ‘good old boy’ factor out of it.” In most cases, someone who has never been convicted of a felony and who can show they’ve taken safety courses will get a concealed weapon permit. Muscatine County Sheriff David White says law-abiding citizens will be able to take some classes, show they’re proficient with a fire arm and get a permit. “Things have changed, you know,” White says. “When people start walking into a Von Maur store in Omaha, Nebraska, and shooting the place up, you know one guy in there that was with his wife that was a concealed carry holder could have stopped many people from being killed there and that could happen in Des Moines. That could happen in Muscatine. It could happen anywhere.” Chris Rager, a lobbyist for the N.R.A., calls it a “momentous” law. He was invited to speak at the bill-signing ceremony. 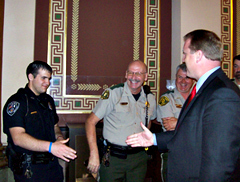 Governor greets law officers prior to signing the gun bill. Representative Clel Baudler, a retired state trooper from Greenfield, has a permit to carry a concealed weapon. Baudler, who is a Republican, also spoke at the bill signing. “A very, very bipartisan bill,” Baudler said of the legislation. “We’ve done a good thing.” The crowd gathered in the statehouse rotunda included a few N.R.A. members in camoflage and Culver told the group he was fulfilling a promise he’d first made on the campaign trail five years ago. “I believe that all law-abiding Iowans who are properly trained to use a fire arm should have a choice when protecting themselves, their property and their families,” Culver said.